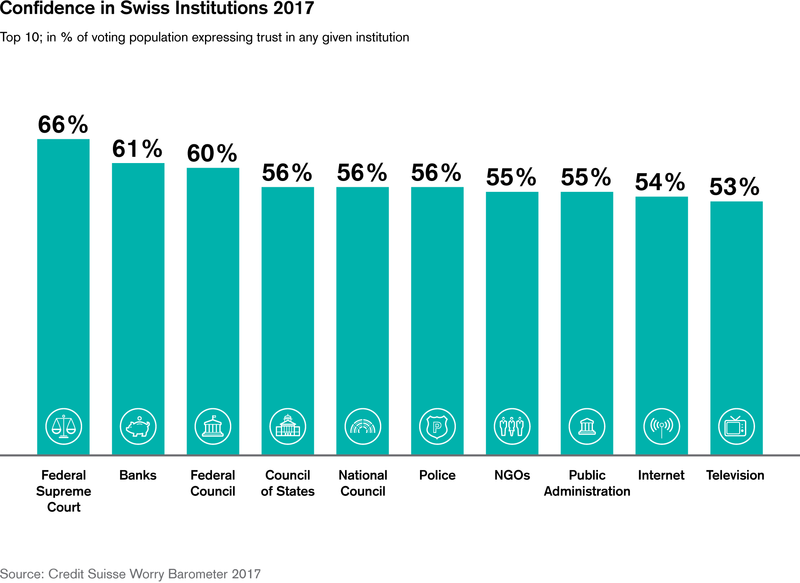 Switzerland's institutions remain popular, but most of them have lost some trust. Among the few exceptions is the Swiss Supreme Court. The Worry Barometer also shows that banks receive more trust than in past years. The Swiss believe in their institutions like no other country. Some 60 percent trust the Federal Council, while average trust in national governments in the OECD as a whole is at 42 percent. Trust is high, but it took a hit this year: Of the 20 top-ranked institutions, 18 saw trust decline – after years of general increases. There were plenty of losers: The Swiss National Bank and the army, each with a decrease of ten percentage points, saw the steepest declines in trust, followed by employee and employer organizations (minus nine and six percentage points, respectively). These sharp decreases may point to a generally higher level of popular distrust of institutions. Study director Lukas Golder explains: "There has been little positive news about institutions of late. The main topics have been the implementation of the mass immigration initiative, the debate about foreign judges and generally the much-discussed polarization of politics." It is also possible to speculate about individual institutions: Do respondents think the SNB has intervened too much to weaken the Swiss franc? Or has it not intervened enough? Has trust in the army waned because of the fighter aircraft referendum (in 2014)? Interestingly, all media (TV, radio, free and paid newspapers) have suffered a decline in trust of between five and six percentage points. This could be a result of the "fake news" debate. There has been and will continue to be a serious discussion about the truthfulness of media coverage surrounding the presidency of Donald Trump, among other topics. It might also be due to the increasing fragmentation of media consumption and the loss of influence of traditional leading media. Here are some of the (few) winners. For the third time in a row, the trust rankings are led by the Swiss Federal Supreme Court (which saw an increase of one percentage point over 2016). It was followed by what is from the perspective of Switzerland's financial center a pleasing challenger: Banks jumped from 13th place to second, with their trust level rising from 57 percent to 61 percent – a gain seen by no other institution. Marie-Gabrielle Ineichen-Fleisch, Director of the State Secretariat for Economic Affairs (SECO), had this to say about the results: "Banks have done a great deal since the financial crisis. They have been actively involved in shaping regulations, driven the tax discussions and made their business more secure. They have done a good job and their work has been rewarded." In line with the good performance by banks, the Swiss generally feel that companies are doing a better job than before: 57 percent of those surveyed in 2003 said that the economy often failed; that figure is now just 23 percent. The ranking of political institutions also improved over this period. In 2003, 53 percent said the government and public authorities often failed; that figure is now just 24 percent. Trust in institutions may have come under some pressure, but this has not affected national cohesion. Quite the contrary. 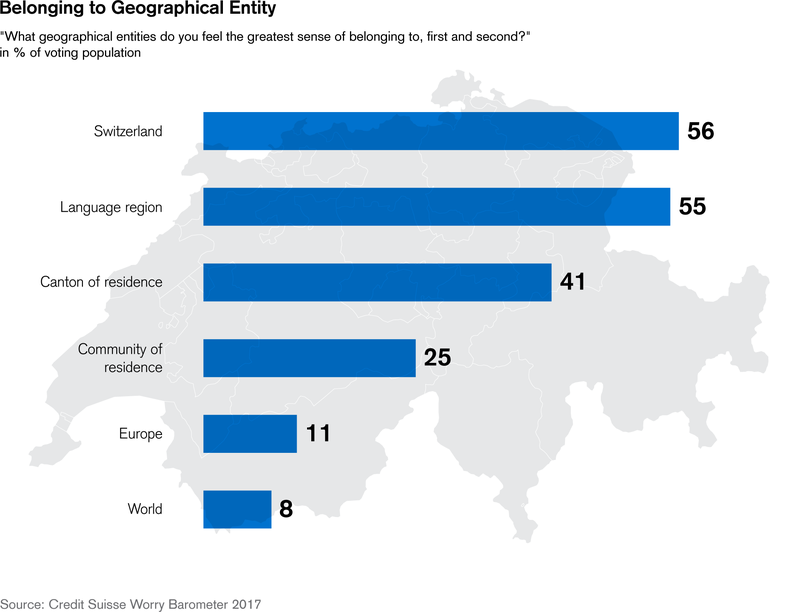 When asked which geographical entity respondents identify most with, 34 percent said Switzerland. This figure is the highest ever and nine percentage points more than last year. Language region and canton of residence (both 22 percent) have remained more or less the same over the last few years, but municipality of residence has declined sharply. The latter had long topped the table with a value of as much as 44 percent (2011). Today, just 13 percent of respondents feel the greatest sense of belonging to Switzerland's smallest political entity. What are the key concerns of people in Switzerland? How much confidence do they have in the major players in the fields of politics, business, and society? For more than 41 years now, Credit Suisse has conducted an annual Worry and Identity Barometer survey to examine precisely these issues. Between June 26 and July 15, 2017, the research institute gfs.bern asked 1,000 voters across Switzerland about their concerns on behalf of Credit Suisse. All of the final reports, analyses, and infographics relating to the Worry Barometer are available in the Download Center. An overview of the results of recent years will help you form your own opinion. Follow the discussion of this year's Worry Barometer on Twitter and share your opinions.